ACCEPT and EXCEPT are ‘Homophones’ while EXPECT is a word with a similar (and confusing) spelling with the word Except. Once again, we are going to battle against the clan of ever so confusing words found in the English language. Well, life is unfair, and so is ENGLISH. When you say that you accept something, it simply means that you are saying yes to the thing that has been offered to you or agreeing with something or someone. You can accept anything, be it a visible gift or an invisible idea. • I accept your apologies. • Finally, the university will accept my application this year. • I cannot accept this expensive gift. This word is used when you don’t want to include something; or when something or someone is left out. • Everybody passed the class except Sam. • I exercise every day except for the Sundays. • I didn’t tell him anything, except that I needed the money. Even though this word looks almost like EXCEPT, the meanings of the two are completely different. If you expect something from someone, it means you want the person to fulfill something that you have anticipated. • I did not expect this kind of carelessness from you. • The meteorologists are expecting that it will rain tomorrow. • We should not burden our children with our expectations. 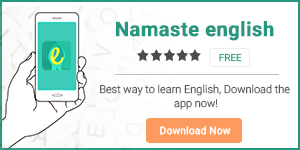 Improve your vocabulary with our English learning apps HinKhoj and Namaste English.